Even though a couple of months have passed since our trip to the DDD / OFFF Italia in Milan (event report here), I was able to meet and interview a couple of giants from different industries. Not only did I get to meet Ash Thorp, but he agreed to sit down with me and do a short interview for the blog. 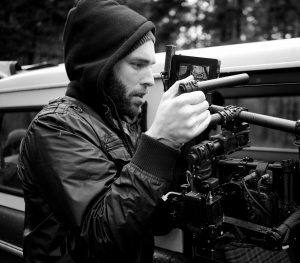 Ash is gracious, accommodating, and genuinely interesting in passing along his knowledge and his story to help others in their artistic and creative journeys. I want to thank both Ash and his wife Monica for granting us this short look into his life and work, as well as Filippo Spiezia and all others involved with the organization of the DDD / OFFF Italia for making it all possible. There is only a small sampling of Ash’s work here, so make sure you visit his website to see the entire breadth of his massive output. Also, make sure to check out his most recently released work, Awaken Akira, at the bottom of this page, and visit the dedicated website for it for the full experience. Enjoy the interview, and let me know in the comments who else you would like to see featured here. First of all, Ash, thanks for sitting down for a few minutes to talk about your journey. I want to keep it informal so let’s get started. So first off, where are you from? Well, yeah, kind of. I’ve lived all over. Ok, but you are from California…. Southern California. Sunny San Diego. People always think I’m in L.A., but I prefer San Diego because it’s more peaceful for me there. A shot from EDIFICE. Click through to watch the film and for full credits. How did you get started? Were you an artistic child? I assume a lot of your influences came from film. I grew up with a very creative family, everything from cooks to craftsmen. My mom was a really great artist and still is. My brother drew a lot. So it was kind of like second nature to be a creative type person. I was raised by a single mom. We didn’t have much at all and life was kind of a struggle, so I would use that as a kind of vessel to escape a reality that was harsh. I started to go into my own imagination, and that’s when I started getting really creative. I would create these false realities, basically, and kind of live in an abstract mind base of it. I’ve always been creative my entire life – I’m just starting to focus on how to really turn it into a profession and be a perfectionist and understand the mastery of it. I’m turning 35 today actually. Thank you. So I’m reflecting on my life and thinking I have a lot of goals to hit before 40. I’m just on a mission and focusing hard to get these things done. Blade Runner poster crop in collaboration with Maciej Kuciara. Click through for more crops and full credits. Well, that’s inspiring to hear how you went through the progression. You mentioned in your talk about the book(s), Mastery. I have followed you for quite some time through your various social media channels, and I find it interesting that you will often recommend books. Not too many people are doing this and I just want to know what you are personally getting from reading so many books? I mean, seriously, why not?!? There’s people in the world that are way smarter than I am, who have already figured out answers to my many questions. I use the book as a vessel to silence my questions basically. I’m extremely curious and I always want to know things. So the books are a way to quiet the voices in my head…[laughs]….the questions that are always constantly floating around in there. Books harness that….OR they drive me nuts and open up another world. Books are a type of time machines, where you can go back in time and learn from somebody in the past. Yeah, that’s a good description of books. It is something that is forever there. Yeah, they are forever there. You can read from Thomas Edison’s diary….that’s crazy. You can read about such an interesting person and study that person. There’s just not enough time to even scratch the surface of how much content is out there for us to read. The trick for us now is understanding how to navigate that abundance of information….figuring out, ok, now I really want to learn this….and then this. When I did the talk, I said, this is what we are focusing on – time management and being a freelancer and trying to be a master of your craft – these are the books that are going to correlate with this talk. But it’s difficult to select which books to read, so you need to find a good source, someone that knows and has good taste. From there, if you’re using a source like Audible, it can make pretty good suggestions of what to read next from there. Sure, you need to find the right things to read…. Yes, because you could read a horrible book, and it could turn you off to books completely. But the right book, can really change your life – if you are willing and you enter that book properly. It is interesting that you say that. There is a book for me that changed my life when I read it 20 years ago. Neuromancer by William Gibson. Ahhh, that’s interesting. It’s a pretty pivotal book. The way he wrote was very visually descriptive. You used to do a lot of work for movie studios, a lot of UI design for the screens and such. What made you want to move towards working on your own? Short sequence from Ender’s Game. That’s a good question. I started working on similar projects and I became this UI guy, and it was always weird because I didn’t even know what UI was before even doing it. So here I was doing this thing that I didn’t realize what it was, and I eventually became this guy known for it. I was just doing it naturally from what I thought things should look like. I ended up working on similar projects for awhile, which led me to think, “ok, what else can I do?” And then telling directors, hey, I can also do other things…You need help with the concept art, world building, other talent, or you need motion. I try to make myself useful from the beginning of a film to the end. A perfect example of asserting my abilities was when I was working on Ender’s Game. I started as a freelancer on a completely different project, and then I saw these two artists in the studio who were drawing and had art everywhere. I thought, wow, that’s amazing, and introduced myself to them; they turned out to be the production designers for Ender’s Game. So I said, “How can I help? This is awesome. I want to work on this, hey, I’m here to help.” And then I suddenly I was on board with Ender’s Game. I went all the way from that early phase of the film through post-production; I think it was about 2 years. I had the chance to fly out to the film set in New Orleans and talk with the cast and director, Gavin, who told me, “Ash, I need you to give him gestures that make sense, so when he’s going in there he’s not just throwing his arms everywhere.” I had to come up with a visual vocabulary of gestures for him. It was a great and rewarding experience. So this project involvement started from a casual encounter, being optimistic, and then hustling and working hard to prove I could help. 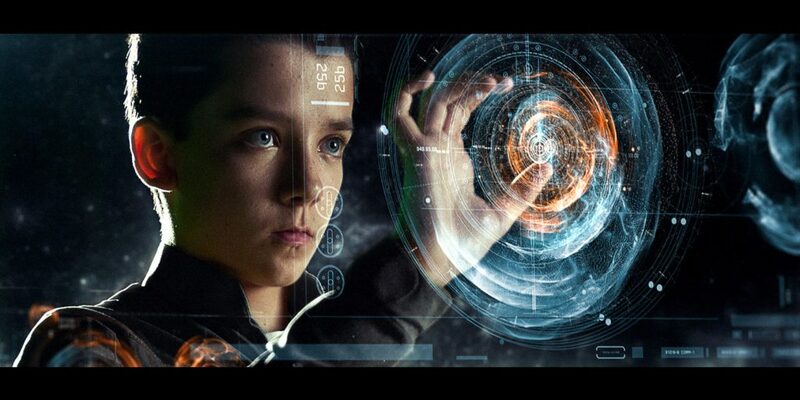 A still from Ender’s Game. Click through for more info and full credits. That’s crazy, but that seems to be a theme and happens a lot when you listen to different people talk about their artistic journeys. You have to put yourself in the right situation and surround yourself with the right kind of people. That’s what I meant about solitude sometimes being a negative of freelancing [in his talk earlier in the day]. You are not active, you’re not in the studio being a part of those conversations, and so you’re missing out on those opportunities, so you have to learn how to create those opportunities in a different way. Well, I can say that you have a lot of fans in the arch-viz industry so they I am sure they will be excited to read this. Thank you so much for having a chat with me today. As promised in the intro, here is a look at Ash’s latest personal work in collaboration with ZAOEYO (XiaoLin Zeng). For the full experience and credits, visit the project website.